Bidyut arrived in Japan 2014 for pursuing post doctoral research. 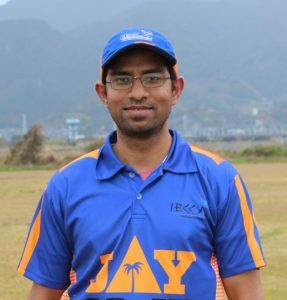 Studious by nature, Siliguri lad could not stay away from cricket and joined IECC in 2014. He has been the most consistent available player for the club since his debut in 2014. Be it a league or practise game, an umpiring duty, 12th man or an club Event, he always has been the leading by example. When on the field, he is Moen Ali of our team. Being left handed batsman, often opens the batting and as situation demands, bats at almost all batting positions. Such is the versatile nature of this lad. Often rotates his arms when required, keeps wickets and takes up responsibility of neat and clean scoring during matches. In 2016, he finds himself in yet another role as “Kit Manager”. He is a role model for any new member coming to the club. He is the “Mr. RELIABLE” of IECC ..